Sharky's Box Office provides tickets to all films and events in Lumina Theater. We also distribute tickets for the Leadership Lecture Series, hosted by Campus Life Arts & Programs. Student organizations, campus departments and community organizations may take advantage of our convenient ticket services for a low fee. Please see our ticketing prices at the bottom of this page. Please check the Lumina Theater Movie & Event Schedule to find specific ticket information for the event you plan to attend. If a fee is charged for a ticket, it can be purchased in person at Sharky's Box Office or online at Vendini. Convenience fees will apply. There are no convenience fees for tickets purchased in person at Sharky's Box Office. If a Lumina Theater movie or event is free, tickets will be distributed one hour before the show, unless the event occurs when Sharky's is closed. Sharky's Box Office accepts cash and Visa. We do not take checks, Mastercard, AmEx, or UNCW OneCard for ticket purchases. Due to University regulations, Sharky's Box Office does not accept credit cards over the phone for ticket purchases. Sharky's does not offer Will Call service for movies. Sharky's Box Office is located on the first floor of the Fisher Student Center at the entrance to Lumina Theater. If there is a 9 p.m. movie on Friday or Saturday, Sharky's will close at 9:30 p.m. Sharky's opens for business on the first day of classes for each semester and summer session. Sharky's is closed for all UNCW breaks and holidays. The Association for Campus Entertainment shows movies during the academic year. 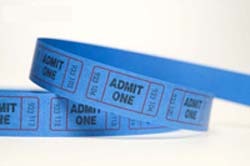 Tickets for ACE Films movies go on sale the Monday before the film is scheduled to play. Every Friday at 6 p.m. & 9 p.m. Sharky's Box Office sells tickets to the Leadership Lecture series that take place in the Burney Center. Tickets are free to UNCW Students, Faculty and Staff, and available for purchase for the Public. Tickets are available the evening of the event in the Burney Lobby or can be puchased in advanced online here. To sell tickets for your campus or off-campus event through Sharky's Box Office, contact Stefanie Norris. Please review the ticket sales service fees below.